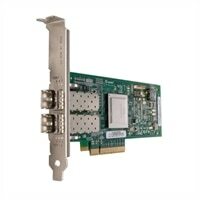 Qlogic 2562 Dual Port 8Gb Fibre Channel HBA, Full HeightThe Qlogic 2562 Host Bus Adapter from Dell™ offers an exceptional performance and advanced management functionality that can shave days off installing and managing adapters. It is coupled with up to 3x better IOPS performance per watt, which makes Dell 8GB Fibre Channel (8GFC) host bus adapters the clear choice for the toughest virtualized, cloud and mission critical deployments. The Qlogic 2562 Host Bus Adapter from Dell™ offers an exceptional performance and advanced management functionality that can shave days off installing and managing adapters. It is coupled with up to 3x better IOPS performance per watt, which makes Dell 8GB Fibre Channel (8GFC) host bus adapters the clear choice for the toughest virtualized, cloud and mission critical deployments.